"Clean, Ventilating, Lucifuge, Dry, No Srange Smell And Pollution"
I have some vague notions about what this "Lucifuge" condition is about. To regurgitate wikipedia, lucifuge comes from "lux" latin word for light plus fuigio meaning to flee. "He who flees the light"! Lucifuge surely must be storage under dark conditions. But if it also means Lucifuge-the demon in charge of Hell's government oversaw the aging of this cake, I'm down with that too. Most likely it would have been one of his minions as I'm sure the real Lucifuge is crazy busy with weightier matters. I must have graduated from wet storage 101 because I can drink it without gagging. That is something. 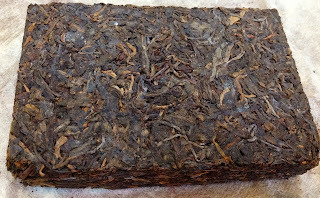 The brick must have dried out for many years as it does not smell so bad and the brew is lighter brown so the wet storage was not too overdone. That moldy shicang flavor has finally grown on me. I've drunk this tea multiple occasions without ill-effects and I'm curious how such a brick will dry out here in Berkeley. The slightly wet 90s Ding Xing is doing so much better so I'm keen to load up on more slightly wet cakes. The ebay listing photos did not show any signs of mold so I wrote the vendor who kindly will send me a dryer version. Is this brick really 15 years old to merit the 90s designation? At least 8-10 years I would guess and I should get some younger trad stored cakes to compare. As an antidote, I finally open up the 2001 7542 sample Jakub sent me that started the whole Luke Skywalker dry storage meme. It's like eating a slice of English cheddar after being assaulted with a ripe morbier. 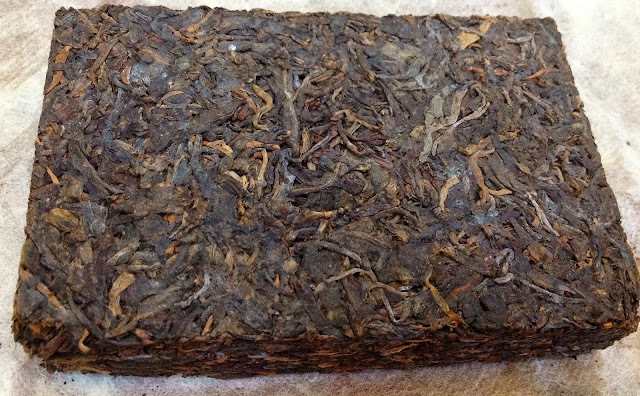 This 7542 is a pricey chunk of pu from Sampletea and I'm happy he sent it to me instead of another dry storage hater. I was saving it for a dry vs. super dry comparison but I went for it today. 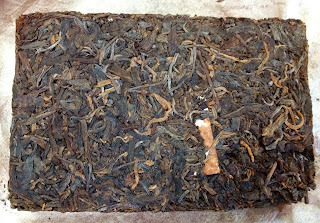 Compared to the 2003 7542 MarshalN sent me, the 2001 version is rather of ho-hum but still a pleasant aged experience. It's not terribly exciting but it's drinkable which is more than what my cakes are now. But if I had to pay triple digits for something like this now, I would be kind of upset. I'm glad I didn't splurge on too many expensive shengs back then only to see them hollow out like this. However if my ten dollar ten year olds start tasting like this in a few years, I would not mind at all. 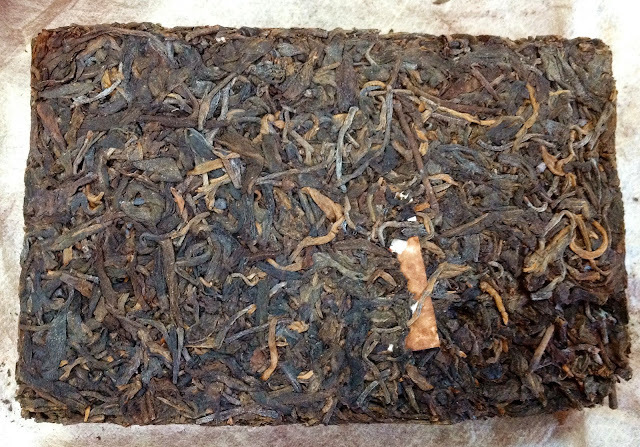 Photos of such a luscious tea-heap help stave off my "Fearbola" as well. The description must refer to the fact that the leaves were given the Danzig treatment. Along with the ventilation and lack of humidity, Danzig's second record was played for the tea on a regular basis. That might account for the dark tint of such a "dry-stored" brick. Not Danzig Israel. My husband tried to get me to add that but I stoutly resisted. I personally play old timey jazz for my pu to get them to mellow out. Any kind of heavy metal for aging tea might be deterimental to easing the astringency methinks. Lucifuge, I love it! Probably one of those terms that got banned in the Middle Ages along with tritones, the diabolus in musica. Jazz is a rather apt reference to add as well!